The annual National Design Awards honor outstanding contributions from the design world, including architecture, fashion, lifetime achievement, and sustainable design solutions. Nominated by a nationwide community of advisors, National Design Award winners and finalists will this year be selected by a jury of past winners. 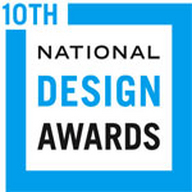 As part of National Design Week, the National Design Awards celebrates excellence in design with a number of special events and educational opportunities.